Ask a cigar smoker why a cigar tastes the way it does and you’ll surely hear about the tobacco used and the proportions in which they are blended. Maybe they’ll mention the time of day the cigar is smoked or what drink, if any, they accompany the cigar with. But largely forgotten is one of the most important variables: time. Some change, like curing and fermenting in tobacco barns or at the cigar factory, takes place relatively quickly. Other critical aging time, like time spent aging tobacco before it is rolled, or the time the rolled cigars are spent in an aging room before being boxed and shipped, can take place over weeks, months, or years. If you’ve ever smoked a cigar fresh off a rolling table you’ll remember how different that cigar would taste from the finished product, even though the difference may only be 15 of 60 days before the cigars go in the box. Obviously, unless you make your own cigars, you have no control over the factory aging process. Most critically (and often over-looked) is short-term aging or resting. Most people do this without even realizing it. The most obvious way is letting the cigars settle from shipping, often for a week or two, particularly when it’s extremely hot or cold out, and if your cigars may have been sitting a hot delivery truck for a few days. Another common form of short-term aging is to let cigars get past what is often called the “sick period,” where the cigar emits ammonia and can be downright unpleasant to smoke. Cubans are known to get “sick” far more than non-Cubans, so often a six-month or more resting period is needed. The most discussed type of aging is long-term aging, where cigars can be aged for years or even decades. A few non-Cuban cigar makers put dates on their boxes, and all Cuban cigars have box dates, making it easier to precisely age your cigars. Cuban cigars are notorious for benefiting from (some would say needing) time to age, often a year or more. And while most of the focus with long-term aging is on Cuban cigars, non-Cubans will also change, sometimes for the better, with months or years. Just remember that aging a bad cigar will only leave you with an old bad cigar. Prime candidates for cigars to age are ones with full flavors that need some smoothing around the edges. Like fine wine, cigars tend to smooth out and add complexity and balance over time, trading fuller body for subtleties, though eventually cigars (like wine) lose too much flavor. So be sure to try your cigars every so often to make sure that time is making them better, not worse. I have yet to "ruin" a full-bodied smoke by letting it rest for a year. But most mild cigars tend to lose flavor over time, and too much aging will make them grassy or bland.__As for the blogging world contributing to the discussion, sign up for the Stogie Guys email newsletter. They publish "Aging Reports" on specific cigars, describing how the cigar developed over time. You probably won't "ruin" a full-bodied smoke, but just remember that cigars won't necessarily get better. A cigar I regularly enjoy is the Padron 1964, but every time I let one rest for 6 months, a year or more, I find that it loses something. My guess is that because Padron is known for using well-aged tobaccos it just doesn't need any age to improve. The Padron 64 and the other anniversary sticks by Padron need no aging. They are ready to smoke ROTT. And yes, it's because of the way they age them prior to release. However, the "1000" series Padrons (2000, 5000, 7000, etc) seem to benefit a bit from a few months of rest. Part of my issue with aging is sample size. Ideally, you'd have a huge walk-in humidor, a virtually unlimited budget, and plenty of time on your hands. That way, you can buy boxes of cigars, label them, and then try one cigar from the box every 2-3 months until you feel you've hit the sweet spot. In the real world, most cigar enthusiasts don't have the time or resources to pull this off. Us regular folks buy a 5-pack, let it rest for a month, and try one smoke. Then maybe you can put the other four to the side for another year (if necessary). Yes, I believe we're shooting in the dark. I've had success with aging, but most of that is due to accident rather than careful calculation. But it's all part of the fun, if you ask me. You're right that long-term aging of cigars when all you have is a five pack largely isn't worth it. But you also don't an unlimited cigar to buy one or two boxes of your favorite cigars and see how it ages. And if it's one of your favorites, and you don't think it's getting better, than you shouldn't have trouble smoking them more quickly. That said, I very rarely age non-Cubans. And most that I do age, aren't so much to see how much age improves them, but because you simply can't get them anymore. Thanks. 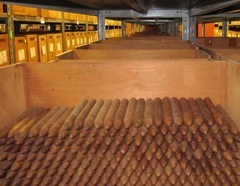 Look forward to checking out Drew Estate’s aging rooms when we visit in May! Nice piece. What I would add is that for the most part, aging cigars is a matter of preference, and does not guarantee that a cigar will get better. Sometimes it doesn't matter how long you age your sticks, the ammonium nitrate still lingers and you have a bad cigar (both Cuban and Non-Cuban). I have heard several times recently that many newer Cuban cigars with box dates post 2007-2009 do not necessarily need aging. This is due to longer factory aging prior to bringing the cigars to market. Many Cuban cigar companies took some criticism over the years for deteriorating quality control, and have since taken drastic measures to produce better cigars. Like everything else though it's pretty subjective. if you like mellower.smoother cigars, I say loose em In your humidor for a while.